This was quite the fun- (and food-) filled weekend for us. We kicked things off with some fun cocktails made with St. Germain elderflower liqueur, and later dined on smoky, crispy soft-shell crab “BLTs” – I sandwiched the crabs between thick-slices of pancetta, and we grilled them over high heat until they were crispy all over. 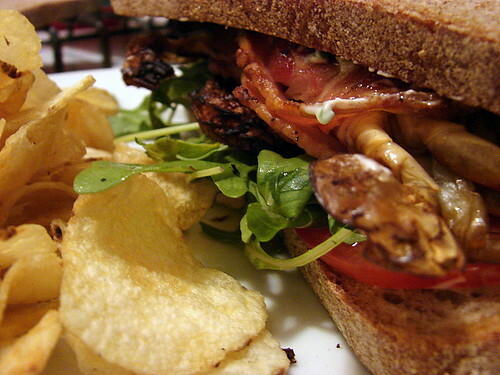 I spread slices of Bread Alone’s wholegrain sourdough with a garlic scape mayo, laid slices of ripe tomato on top, added the pancetta-wrapped crabs and finished each sandwich with a handful of wild arugula to add a nice peppery bite. We picked up some grass-fed flatiron steaks from Elk Trails while on our regular Saturday food safari, which Mike grilled up for dinner that night. 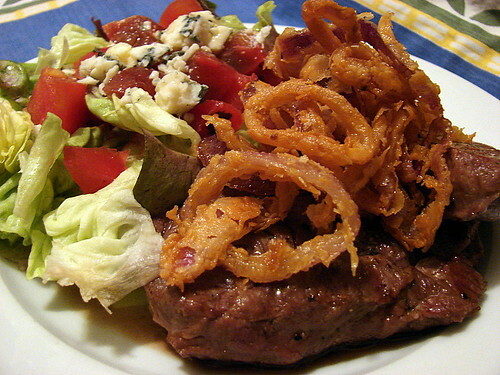 I made a crunchy chopped salad with red butter lettuce, chopped heirloom tomatoes and blue cheese vinaigrette, and I topped our steaks with a pile of onion rings – thin slices of red onion which I had salted and marinated with a tablespoon or two of Sriracha, then tossed lightly with flour and fried briefly until crisp. 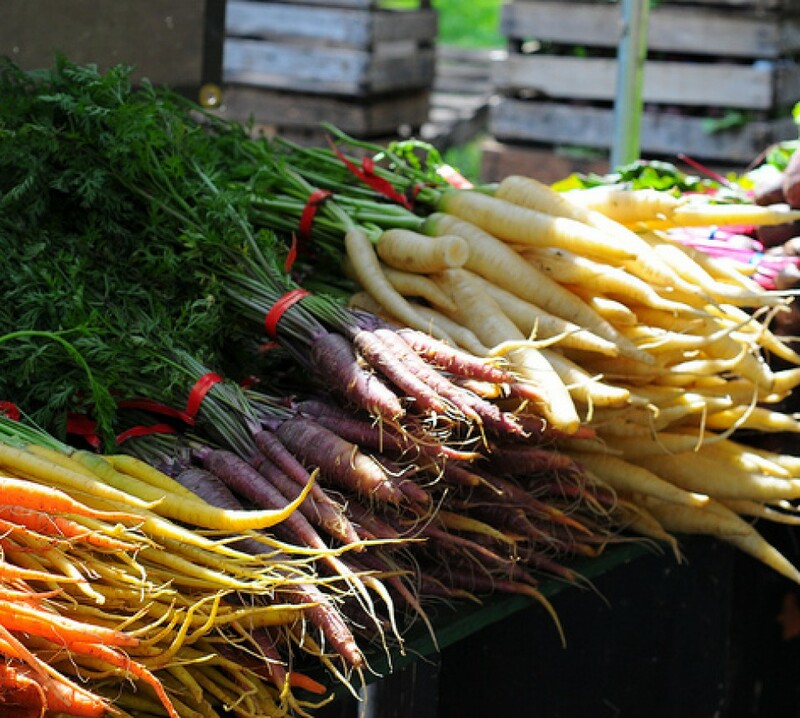 I also spent some time on Saturday assembling items for a picnic lunch – we had plans to head to Central Park on Sunday to catch a Summerfest show and would need to get there early, so I wanted our stuff to be ready to go. Mike brought home a loaf of crusty sourdough which I sliced lengthwise and hollowed out. Rather than layering the ingredients as is traditional, I mashed few anchovies into a basic sherry-Dijon vinaigrette and tossed my chopped olives, tomatoes, and capers with that. 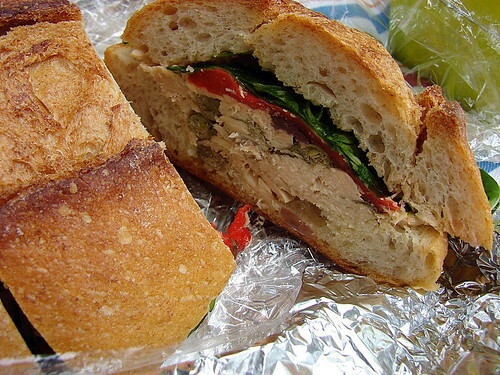 I mounded it into the hollowed-out bottom bread shell, layered roasted red peppers and arugula on top, added the top of the bread and wrapped it tightly in plastic wrap and foil. 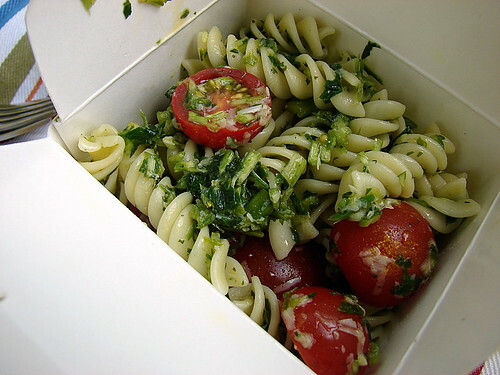 I also put together a pesto of garlic scapes, parsley and chervil to toss with rotini pasta and halved cherry tomatoes. When Sunday came, we grabbed our picnic blanket, packed up our sandwich and pasta salad as well as a lovely little wheel of Capriola cheese from Saxelby Cheesemongers, and set out for the park. The music was great, the food was tasty, and the weather was absolutely gorgeous – what a perfect way to wind down the first weekend of summer. were your Elk Trails steaks bison or bovine? I am a massive fan of their buffalo meat. 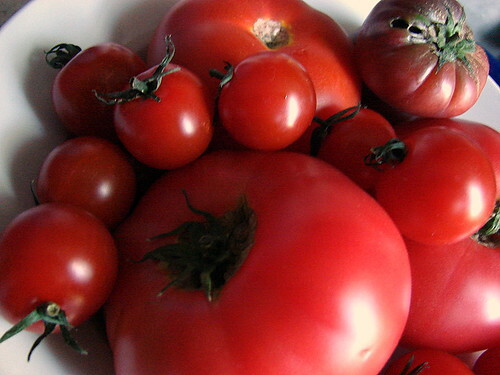 It’s so tender and delicious and healthier than beef to boot. Good stuff! Man, it’s a wonder we’re not still in a food coma. Ann, the steaks were of the bovine ilk (one end moo, etc.). We do often get the bison, which we enjoy, but I just looooooooooove the Angus. ann, like Mike said we got the angus this time around, but I agree, I LOVE their bison. Ah! What a nice lunch! It sounds cozy.